Home » Uncategorized » English or Biblish? (I’m grateful to Mark Strauss and Gordon Fee for bringing this word to my attention in their excellent book, How to Choose a Translation for All Its Worth [Grand Rapids: Zondervan, 2007]). Modern translations, he felt, had left behind the formal language of heaven (God’s language) preferring instead the mundane language of “this world.” The translation he loved sounded more “spiritual” to him than the newer ones, so he was against them, pure and simple. Like many people, my friend had a deep emotional connection with the King James Version of the Bible based on all the years he spent in church and Sunday School. As a seminary graduate and a recently minted PhD in New Testament, I tried to explain to him all the complexities of Bible translation. I talked about translation theory, the ins-and-outs of determining word meaning, the difference between functional and formal equivalence. I defended the need for newer translations. But it didn’t matter. His mind was made up. The basic concern we had as a translation team on The Voice was to render Greek, Hebrew and Aramaic sentences (our source languages) into meaningful, natural English (our target language). In other words, the goal of any English translation must be English not Biblish. As Strauss and Fee note: “Biblish results when the translator simply replaces Hebrew or Greek words with English ones, without sufficient concern for natural or idiomatic English” (p. 21). Translation is not about exchanging this Greek word for that English word or this Hebrew word for that English word. Translation is not that easy. It involves knowing both the source and target languages well enough to be able to move back-and-forth between them. It entails an understanding of culture—then and now—and recognizing how language is one of the key vehicles of culture. Translation, I have come to understand, is not a science; it is an art. I’m not sure what my friend would think about The Voice. I haven’t seen him in years. I hope he would have mellowed a bit and would appreciate what we have tried to do. In the last year I have met a number of people who prefer the KJV but now read regularly from The Voice. But, if I’m honest, I’d be disappointed to learn that my friend had lost his deep, emotional connection with the KJV. 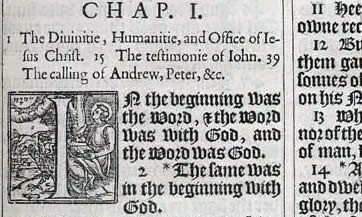 The KJV is a great, historic translation, even if it is no longer in our language. By David B. Capes in Uncategorized on March 7, 2013 .